Thought I'd pop through with some photos of the day! We have decided that this is our best ever Coffee Cake & Create! Thank you for a great afternoon ladies and now I cant wait for the All Day Scrap! On Saturday July 4th, I am doing a fun double Christmas page in the afternoon. This page can either hold a few small photos or a couple of large ones - the choice is yours. Then on Monday 5th at 7pm, my Page Maps class will be on. Three great designs this month! See you all this weekend at the Coffee Cake & Create afternoon! Just blog hopping with my coffee this morning and stumbled across one of my pages on the Cosmo Cricket blog! Some of you have done this page! The newsletter is out people! If you have not received your email, let us know! Scrap the Girls, Cuttlebug, Scraplift and Cards!!!! Just flying through with last nights Scrap The Girls page. We used the Fancy Pants line - "About A Girl" with ribbon and of course some chipboard! Tonight is Late Night Scrap - 6pm until 10pm - ring up to book in .... there are still spots available. Tomorrow is a busy day in the shop! I am teaching the "Domestic Goddess" page at 10am then the Cuttlebug class in the afternoon! I'm really looking forward to teaching the Cuttlebug class! So much to show you! Monday night will be three classes! Kathy is teaching her "Card With A Difference" and it is stunning! Steph is teaching her "ScrapLift" pages and I will be doing "Book Of Me". Next Saturday is the Coffee Cake & Create day. If you have booked into this afternoon, you wont be disappointed! If for some reason you cant make it, please call as soon as possible as we are cutting the kits this week! 8277 1298. Just popping through with a couple of sneak peeks for you! Next Thursday night I will be doing my monthly Scrap The Girls Class! This month I have designed a beautiful double page using Fancy Pants papers! There is still plenty of room in this class and would be great for beginners thought to intermediate scrappers! Also, here is the first of the School Holidays projects! Girly Keepsake Box : This is a super cute little Keepsakes Box that is perfect for keeping all your girly bits & pieces. Have Natalie help you choose your own papers and flowers to make this little box a beautiful place to keep your smallest most secretive items! There are only 7 spots in this class so book now! Can you believe that it is June already? Where on earth did the first half of the year go? We are currently working on our next newsletter and class schedule and fingers crossed it should come to you in the next 10 days! We have some amazing classes coming up so watch your inbox! School Holidays are nearly upon us again and there are 4 classes planned. I will be doing a Keepsake box for the girls on Wednesday July 7th at 10am, there will be Kids Cards on Friday 9th, I will be doing another kids class on Wednesday the 14th at Sam will be doing her super cool tags on Thursday 15th and spaces will be limited for these. Coffee Cake & Create is nearly BOOKED OUT! If you were wanting to attend on Saturday June 26th, please call and add your name to the waiting list! The All Day Scrap is half booked now! We have limited spaces for this and most of you know what a great day this is! Lots of amazing projects, give aways, excellent teachers, AMAZING food and a great day to spend with your friends! July 31st is the date! The shop also offers 20% off all floor stock only to those attending so book in now! Kathy has the most amazing Card class coming up. Once a month she will be doing "A Card With A Difference". On Monday 21st at 7pm, she will be creating this stunning card using a new style that you will love! Here is a sneak peek. This class will not be repeated so call to book in NOW! You wont want to miss out! All the new products for DoCraft are in and there is some fabulous stuff! As usual, it's walking out the door pretty quick so pop in today and grab some when you pick up your pre ordered magazine. So there is always something going on at the shop and we would love to see you! Cuttlebug, DoCraft & Sneak Peeks! Here is Steph's page for next Monday Night. Monday 7th June 7pm. 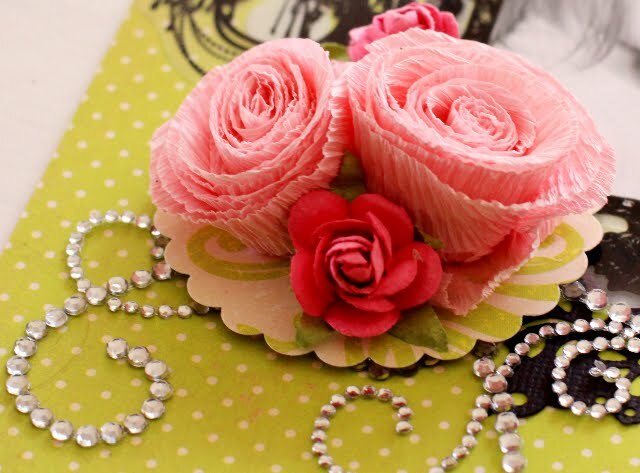 She has used some beautiful handmade crepe paper flowers. The texture of these is just gorgeous. Once again if you want to do this page, just give the girls at the shop a call. Here is a sneaky of the "Nats Page" planned for Tuesday June 15th at 10am This is a nice and bright page and would be perfect for a family photo. Next is the Cuttlebug class on Saturday June 19th. This is a double masculine page involving lots of embossing and technique. Lots of fun! DoCraft magazines are in so pick up your pre-ordered copy today! Also we have 5 Cuttlebug machines in at the moment for the bargain price of only $130 each instead of $149 so grab one now!